We would like to take this opportunity to give you all a 2014 wrap up, and an update of what is going on in 2015. Overall 2014 has been a great year for us at Nordic. Our coffees have tasted great and have been very well received in the market, many baristas have performed well in competitions with our coffees, and most importantly we have had a return of satisfied customers increasing their annual volumes with us. I would firstly like to thank all of you, producers, exporters and clients for supporting us. On the producer/exporter side we are dependent on you producing exceptional qualities and being able to mill and ship these coffees on time. Our clients are the ones that, through purchases, confirm that all the work and efforts the producers/exporters and we at Nordic Approach are putting in to this is worthwhile. Secondly I would like to give you all an update on Nordic, and where we are heading. Even if we still consider the company as a start up business we are hopefully improving and are getting more professional every year. We are now a team of 5 in the office in Oslo, and we are soon to open and establish a cupping lab in Ethiopia, in addition to this our accounting and finance are looked after by a guy living in Amsterdam who is working with us part time. For general sales and inquiries it’s mainly Alec, Joakim as well as Joanne. Morten and Joanne will mainly be doing most of the buying, but will follow up with clients as much as they can. Joanne Berry – joanne@nordicapproach.no – recently joined our company as a coffee buyer. She’s started up now in January and will be managing quality control for all origins, and will be focusing a lot on travel and development and sourcing in Africa. She’s a former coffee buyer at Mercanta in the UK. Alec Oyhenart– alec@nordicapproach.no – has been with us from the start, is mainly managing the office, back office, logistics inbound and outbound as well as sales. He’s also partially sourcing in the Central America. Joakim Pedersen – joakim@nordicapproach.no – joined the company in 2014 and is working on the marketing, our new web, as well as sales and some projects related to origin. Kaya Caretta Herlofsen– lab@nordicapproach.no – will replace our currant lab assistant and will be the lab manager dealing with sample roasting, sample logistics and systems, cupping etc. Kaya is currently working in Solberg & Hansen as a coffee roaster and will join us in April/May. 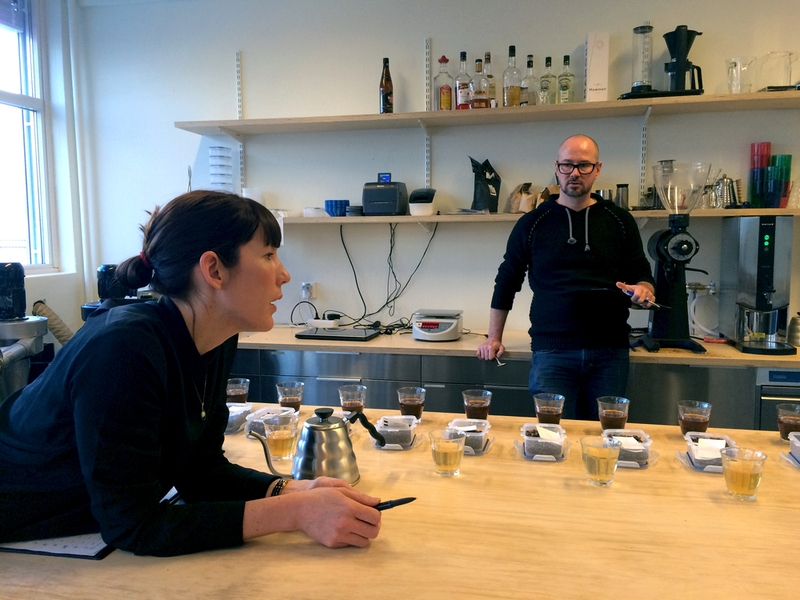 Morten Wennersgaard – morten@nordicapproach.no – Managing Director and coffee buyer. Still totally involved in purchase from all origins, and cupping through loads of coffees. Currently initiating projects in Colombia, this will soon be one of our main origins. He is also working on sales, strategy and is doing his very best to manage cash flow and finances. Seife Tuloskorpi – seife@nordicapproach.no – our country manager for Ethiopia. Living there six months of the year to follow up all our activities there. Blair Bailey – accounts@nordicapproach.no – Our accountant and financial guy. You might be hearing from him from time to time, but generally he will work behind the scenes. He’s based in Holland, and is for now only part time with NA as an independent. In short we should, with more staff and specialists, be able to cover more ground at origin as well as have more time to follow up with clients. We are investing in better systems to manage finance, inventory and accounting, as well as a CRM system to manage our clients and sales more efficiently. We aim at sourcing even better coffees and being more involved in the activities and processes at the producer and export level. We will also like to be ahead of and surprise our clients and give them the service, information and support needed to help them to improve and grow within their markets. UK – seems to be growing into one of our main markets. This is great, and the coffee scene there is really developing fast. Scandinavia – as a whole is still growing and we are very well received. Norway and Sweden counts for a big part of it, but we seem to have more presence now than before in both Denmark and Finland. Central/Eastern Europe – is coming along as well. Many of the smaller countries like Austria, Switzerland, Belgium, and Holland have a very positive trend in specialty as well as there is a lot going on in the German market. The Baltic, Poland, and Czech Republic are all increasing volumes in the quality segment. We will try to be way more active here in 2015. Southern Europe – it is just happening! Spain and France have had some active clients since we started, and now Italy seems to have a handful of roasters more interested in our kinds of profiles. Russia – is still going strong, but it’s mainly Moscow. That said there is a lot going on in other cities and parts of Russia, with a great crowd of upcoming small to medium roasters. Australia – we are still working in very close relationship with Silo Coffee in Melbourne. The small roasters have been able to access our coffees, specially the Africans, through Silo. We are also dealing directly with other roasters that are able to bring in coffee themselves directly from origin or from our UK warehouse Eniti. Asia – we currently have dedicated clients in Taiwan, Singapore, Hong Kong, Korea and Japan. US – even though we are not yet actively working in this market; we do have some presence there through a few roasters. If anything, this will be something we want to increase slowly. Ethiopia – will still be our main origin in terms of volumes. We are potentially opening a cupping lab there that will hopefully be operational by the end of 2015. We are currently working both with the Cooperative Unions as well as some private exporters. We have already cupped the first outturns and they seem to be great. Kenya – will be maintained and we will gradually grow the volumes. As the Nyeri situation is not solved we are actively working in other regions and are surprised by how much amazing coffees there actually is in places like Kirinyaga, Embu, Muranga etc. There are tons of great coffees from these regions, and we will manage our buying strategy to ensure we always get the best there is out of Kenya. Rwanda – Rwanda (as well as Tanzania and Burundi) are harvesting in the opposite season of Ethiopia and Kenya. This enables us to have fresh Africans all year around. We also had our first year as a producer at Kamiro with the Motherland farmer project where we are partners in a farm and a washing station. Besides this we have great producing partners that are constantly improving and we see great development in quality. Burundi – we have a few very good suppliers in Kayanza that are increasing their volumes and number of washing stations. By working in close relationship with them we are hoping to have great impact on the quality. And the coffees have amazing potential. We have good amounts left of relatively fresh Burundians. Tanzania – we just started this year with a trial on a few products from the south of Tanzania where there is a lot of investment and development on small CPU’s (Coffee Processing Units) meaning washing stations. It will be very interesting to follow up, and we have high hopes! Colombia – is where we are currently putting in a lot of time and effort. The products and potential is amazing. Still, there are challenges on several levels such as political, geographical, as well as climate issues that make picking, drying and storage challenging. They harvest coffees in Colombia more or less all year around. Our strategy is to buy coffees often and have fresh arrivals up to 4 times a year as they are constantly harvesting there. Brazil – we are buying small amounts of Brazils that we think are very different from the general coffees offered in the market. This can be with different flavor profiles from other areas than the well-known ones, or just great value added products. El Salvador – we have a very strong and quality oriented partner in Santa Ana with many different farms and a great variety of cultivars. We are here able to have direct impact on the process and quality. We are also working in the east, in Usulatan, with a producer that’s very progressive. He’s also processing coffees from the surrounding farmers at he’s wet mill. Costa Rica – we have a selection of micro mills we will continue to work with. The quality is exceptional, and the flavors different from other coffees in the Centrals. They are also experimenting a lot with different processing methods that gives us access to a wide range of flavors. We have decided not to increase in to new countries in the Centrals. There are several reasons for this. One is that there are other origins, like Tanzania and Colombia, with great potential. If we are to invest in the right kind of groundwork and sustain this, we can’t be everywhere. It is also because many of our clients and/or competitors are strong there and the supply available of the best coffees is limited. Meaning there is a lot of competition and worst case we end up competing with our own clients. It is after all the origins where it’s easier to work directly for the roasters. Our main goals for the next year is to have moderate growth in volumes, but be able to more professionally manage the quality at origin as we grow, and be more involved in new projects. We will also invest in more and better systems and structure on procurement, finance, sales and last but not least information through the new website. We think this will be of great value for our clients and Nordic, and will contribute to a good foundation for the years to come. Our major challenge is still finance. Our available resources in this area are spent on coffee purchasing and increasingly on financing the coffees of our clients. Even if we wish to do so, and know it is limiting their buying capacity from us, we are still pretty restricted. We are working on this issue, and as we prove we are here to stay, and that our model is sustainable I am sure we will find a way to more easily access liquidity and funds. We are currently having fresh crop of both Tanzania and Burundi from Africa in the house, as well as newly arrived Brazil and Colombia from Americas. We are also starting the buying from Ethiopia, Kenya and Centrals, but except from a few coffees most of it will arrive from April and onwards. A little late perhaps, but I wish you all a happy new year, and a great 2015!